Japan was struck by the greatest earthquake off its North coast on 11 March 2011, which was devastating and destructive, unleashing a 13 feet Tsunami that created havoc. Almost more than hundred volcanoes are active in Japan. But this earthquake hit the sea bed in (pacific ring of fire). The epicenter of this quake was 350 km away from Tokyo city and 130 km away Sindai, 24.5 km in the bottom of the sea. The magnitude of earthquake was 8.9. The waves rose from 12 to 30 feet high due to the very high magnitude of earthquake and lesser depth of the sea. That is the reason city of Sindai is devastated. Now the question arises whether there is any method available with our scientists who can help them to estimate the forthcoming of earthquake or Tsunami. However, there are certainly some astrological combinations for estimation of such occurrences. But they have their limitations, they can tell approximate period, in terms of months or days but for the exact place of occurrence, there is no concrete astrological basis to predict. It is the latest news that on 19 March 2011, after a period of 20 years, Moon shall come nearest to the earth. This position of Moon is called Super Moon or big moon. Is this not the main reason for earthquake? The earth moves round the sun in an elliptical orbit. So is the orbit of Moon while moving around the earth. Moon comes closer to the earth every month to drift away. But its coming closer to the earth takes place on Full Moon day (Poornima) or Dark Moon day (Amavasya). This state of Moon is called Super Moon. At this time, Moon looks much larger. According to astronomy whenever Sun, Moon and Earth come in one line (on Poornima or Amavasya) and Moon comes 90% under its perigee. Then it is called Supermoon. This incident takes place once after every eighteen years in the month of December or January because in these months the Sun is closer to the earth. The combined gravitational force from Sun and earth pulls the Moon towards earth and makes the state of super moon. Supermoon will take place at 23:40 hrs IST on 19 March 2011 this year. On this day, Moon will be only 356577 km (221567) miles away. Otherwise its normal distance from the earth is 384400 km (238856 miles). This time, Moon will be closer to earth than at any time since last twenty years. 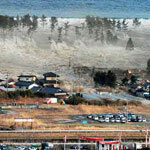 As it is well known, the last Tsunami which hit on 26 December 2004 had created havoc in Indonesia and India. That tsunami came only fifteen days before the SuperMoon which was about to happen on 10 January 2005. This time also Tsunami hit only nine days before the Super Moon. There are examples of other massive earthquakes which took place on earlier occurrences of Supermoon. But the disaster caused by it depends on the epicenter of the earthquake. Generally, earthquake takes place due to increased gravitational pull of planets. Sun & Moon both increase their gravitational pull on earth due to its state of Super Moon. It is an accepted fact that earthquake occurs due to the movement of earth plates. More gravitational pull works as a lift to move the earth plate upwardWith the upward movement of plate or its lesser pressure on the other plate, it is distracted. On 6 March, 2011, in the position of Supermoon, the moon was closer to the earth but Mars, Mercury, Jupiter and Sun also were in close proximity forming an acute angle which increased gravitational pull on one side. Moreover, Saturn was also posited on the opposite side of these planets, which increased its impact and it resulted in the earth quake followed by the calamity of Tsunami in Japan. A study of major earthquakes of the past, reveals that most of the earthquakes occurred generally on full moon day, Dark moon day or within three days of it or the sixth day of either of the Pakshas (shukla paksha or Krishna Paksha).Even this time, the earthquake hit Japan on 11 March 2011 i.e. on Shukla Paksha Shashathi. According to Astrologers, earthquakes have an association with Moon’s transit in immovable signs like Taurus, Leo, Scorpio and Aquarius. The information about the exact epicenter of earthquake can be obtained from the position of planets at the time of eclipse and Bhav Spasht. It has been so mentioned in our Samhita granthas. From a comparative study of the most devastating earth quakes ever happened on this earth, it is found that in more than 90% cases Sun, Mercury, Venus, Moon and Mars were all lined up in one direction or Krishna Paksha moon was just opposite to the Sun. Even a kal sarpa yoga (partial or full) was also present in the sky at the time of quake. On 11 March 2011, Tithi was shashathi of Shukla Paksha. Sun, Mars, Mercury and Jupiter were posited with in a space of 30° and there was partial kalsarpa yoga also. Except Saturn, all planets were present in Rahu-ketu axis. Moon was in exaltation in Taurus and in the state of super Moon. Saturn was on the other side of all other planets. Transit of planets indicates that even now, the possibilities of other earthquakes on the earth will continue upto the third week of April and May. But predictions of its exact time and place are still beyond the astrological ambit. More exact prediction can surely be made in future after a research on this subject and astrology can be made more useful for the common men.